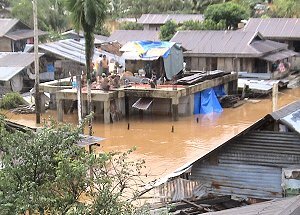 BORONGAN, Eastern Samar – Maslog town Mayor Septemio Santiago yearns for four rubber boats and an evacuation center for his flood prone municipality. After three weeks of rainy days, he and his people are always on the look out for the rising water level. The mayor recalled that flooding also happened in 2008 while he was already serving as the mayor then. “It was not as much as the flood waters recently,” Santiago shared. “I was just thankful the floods happened during the day and we saw our way during the rescue operations, had it happened during the night, many would have died,” the Mayor was visibly pained with his recollection. As they did house to house rescue, the rubber boats they used got damaged, thus, wishing for a new rubber boat is the mayor’s yearning. “I also wish to construct an evacuation center for my people,” the mayor added. He knew that despite his plans to permanently relocate his people in higher and safe area, some, still may opt to remain, where their livelihood is, so that the town needs an evacuation center where the people can run to in calamities like the most recent one. Mayor Santiago is aware though that some of his constituents are so ingenious to use indigenous materials in constructing make shift shelter during the flood. In the pictures he sent to PIA E Samar, his people used coconut leaves, bamboos and other materials that abound in the area to construct temporary shelter. But his people may need a more durable evacuation center that can withstand the onslaught of natural elements in the future. As the days wear on, the Mayor and his people are fervently wishing that the multitude of the generous-hearted who provided them relief packs could also help them by providing the rubber boats he yearns and the evacuation center. CATBALOGAN, Samar – “Samar continues to languish in the yoke of underemployment as it is currently rated the 7th poorest province in the country. Unemployment/underemployment rates remain high; economic activities are limited and productivity low; commerce and industry have actually declined over the years; natural resources (esp. the forest and the sea) have been degraded; the people, especially in the rural villages are unserved and governance is largely ineffective and most often mired in corruption. We all feel that Samar development has been downhill for decades…” are Mr. Rene Nachura’s exact words to justify the need to convene the Samar Development Agenda Conference. Samar personalities, like Charo Cabardo, Fr. Cesar Aculan, Rhet Piczon, Nestor Nachura, Mayor Lu Astorga, Fr. Noel Labendia, Mr. Luisito Uy, DA Raul Repulda, Erlinda Uy, Evette Nachura, Joson Ocenar, Ojie Acaba and Emy C. Bonfacio were among those present during a draft-concept presentation of the project at STI, Tacloban City last January 20, 2011. Past initiatives undertaken by the various sectors to remedy and jump-start the strategic and integrated development of Samar, where results have been observed to be meager and disappointing, were assessed. “The new administration’s promise to forge a “matuwid na daan” in order to end poverty is an opportunity that is being offered to Samarnons to give development another try. However, at this point in time, Samarnons must take the initiative into their own hands…want it, plan it and work on it,” Nachura added. Having considered the urgency of convening a multi-sector gathering, a Samar Development Agenda Conference has been set on February 28 to March 1, 2011. The two-day conference-workshop is intended to mobilize the different sectors of the Samar people – citizenry, church, government and business – to start taking charge of their own development and destiny. The Samar Development Agenda conference will be a gathering of more or less 50 individuals who will draw up a coherent, concrete and viable development “agenda” for the next five years (2011-2016). The conference will commit to promote and implement the agenda and present it to the P-Noy administration for the support of the National Government. It was agreed that the agenda will not be a comprehensive strategic plan. It will be a set of deliberately chosen priority activities which must be done and accomplished within a given time-frame. The proposed agenda is also expected to be do-able and concrete, having wide-reaching and longer-lasting results and within clear strategic development framework that will contribute to its eventual realization. It was made clear that the object of the agenda is both integral and integrated. “Genuine development is not simply economic growth. It should be multi-faceted: meaning economic growth should be integrated with the social, political, environmental, psycho-cultural, religious and other dimensions of human and community life” Fr. Cesar Aculan stressed. The development agenda is supposed to cover various categories such as the following: SIPPAD/SSPADE concerns on poverty alleviation, social services to include infrastructure, environment, governance and peace; NEDA and RDC 8 issues on Job Creation, enhanced social development with direct poverty alleviating measures, improved infrastructure and logistic support and good governance; and the DILG Guide for Local Development Planning which includes sectors on Land Use, Economy and Financing, Agri-Industrial, Human Development, Infrastructure Development and Development Administration. Furthermore, the consideration of a Cluster approach to Agro-Enterprise Development as a possible framework for the development agenda will also be presented in the conference. Mr. Raul Repulda of the Department of Agriculture shared his expertise through a briefing orientation on the cluster approach during the STI forum. Preparations for the conference are on-going. After a thorough briefing on the project, members committed to take responsibility of the respective tasks. A more updated and factual presentation of Samar’s situation will be prepared, as basis for the workshop planning. “We really appreciate the efforts being made by these sectors. Hopefully, these initiatives will challenge our provincial administration and come up with a more comprehensive community based development plans and programs that will sustainably alleviate the plight of 70% poor families in Samar. We are lagging behind in all aspects of development. We need to regain our lost dignity due to too much poverty and corruption. Now is the time for both the public and private sectors to work together for fruitful results. Hopefully, this forum will bring out participatory discussions and solutions to these social concerns. Not unless we help ourselves, we cannot expect help from outside…” was a businessman’s appeal to everyone as he emphasized the all-out support of his sector. On the other hand, MATA-Samar expressed its support by documenting all related activities as its secretariat. The anti-corruption group was appreciative of this move knowing that the provincial government has long been incapable and remiss in sincerely delivering the basic needs of its constituents. “Samar has been eaten by dirty politics. Too many resources intended for its constituents are being abused and mismanaged, thus multi-sector efforts in Samar are seen to be more credible and gaining support from the national government and its people,” a MATA Samar official comments. CATARMAN, Northern Samar – The University of Eastern Philippines will host the forthcoming State Colleges and Universities Athletic Association (SCUAA) meet on January 28-31, 2011. This was learned from Mrs. Romula A. Obleopas, the media relations officer of the university. Obleopas said that the university is now ready to host the event and is taking measures to ensure safety of the participants and a successful athletic event. Their athletes undergone rigid training and is now ready for the competition, she added. SCUAA region 8 is composed of the following: the Eastern Samar State University (ESSU Falcons), Eastern Visayas State University (EVSU Hawks), Leyte Normal University (LNU Normalities), Naval State University (NSU Pioneers), Palompon Institute of Technology (PIT Mariners), Samar State College of Agriculture and Forestry (SSCAF Forestmen), Samar State University (SSU Webmasters), Southern Leyte State University (SSU Flamingos), Northwest Samar State University (NWSSU Clippers), University of Eastern Philippines (UEP Dolphins) and Visayas State Colleges (VSU). The State Colleges and Universities Athletic Association (SCUAA) is one of the inter-collegiate sports association in the Philippines closely related to UAAP, the union of six major state colleges and universities in Metro Manila. The organization was established as the State Colleges Athletics Association (SCAA) in 1953 encompassing the Philippine Normal College (now Philippine Normal University of PNU), Central Luzon Agricultural College (now Central Luzon State University of (CLSU), and the Philippine College of Commerce (now Polytechnic University of the Philippines or PUP), and Rizal technological Colleges (now Rizal Technological University or RTU). SCAA saw itself transformed into SCUAA in the 1970s when PCC and the Philippine College of Arts and Trades (now Technological University of the Philippines or TUP) a member school since 1959, converted into a university. Despite many years of challenges in the forefront, SCUAA was able to gain grounds in various regions in the country through the creation of regional or satellite SCUAA, hence the establishment of a National SCUAA in the mid-1980s. Known for using sports such as biking, running and triathlons to bring her advocacies to communities across the country, Cayetano started Bike for Hope in 2004 in memory of her father, the late Senator Companero Rene Cayetano, who died from complications of a liver ailment in 2003. The lady senator will be joined by Palawan Governor Abraham ‘Baham’ Mitra and several cycling groups in the province. Following a 70-kilometer route that will take the bikers to known local landmarks such as the Ospital ng Palawan, Crocodile Farm and Iwahig Prison and Penal Farm, Bike for Hope will kick off at six in the morning on Saturday at the Shell gasoline station along Malvar Street in Puerto Princesa, and end at the Aborlan Public Market around noon. Interested bikers may join by registering from January 27-28 at the “Chooks to Go” branches in San Pedro and Rizal Avenue, Puerto Princesa, from 9am to 9pm. Bikers can also register on-site beginning at five in the morning on event day. More than just a sports event, Cayetano said that Saturday’s bike ride will be preceded by Pinay In Action (PIA) community seminars to be held on Thursday and Friday at various venues in Aborlan, Narra and Puerto Princesa. The seminars to be attended by local community leaders and barangay health workers will tackle the senator’s advocacies including breastfeeding and anti-violence against women and children. Another highlight will be the two-day ‘Train the Trainers’ sports clinic to be held on Friday at the DepEd building in Bancao-Bancao, Puerto Princesa, and on Saturday at the Ramon V. Mitra Sports Complex. The seminar will train 150 physical education (PE) teachers in the province to be conducted by brothers Phil and James Younghusband of the famed Philippine National Football Team, the ‘Azkals.’ The seminar will likewise include the Pinay In Action running clinic to be led by triathlon champion and national coach Ani De Leon. The 10th ‘Bike for Hope-Palawan’ is a joint effort of Pinay In Action together with the Palawan Provincial Government, Younghusband Football Academy, Coca Cola Foundation, Unilab Active Health, Pfizer, Glaxo Smithkline and Malampaya Deep Water to Power. 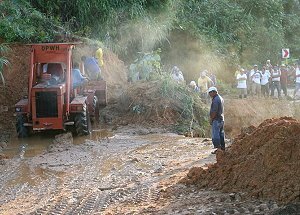 TACLOBAN CITY – The Department of Public Works and Highways continues to repair roads in Eastern and Northern Samar that were damaged by the torrential rain since January 2, 2011. Per report submitted to the Regional Disaster Risk Reduction and Management Council of Eastern Visayas, DPWH Director Rolando Asis informed that only half lane is passable at the Camp 5 Boundary, Junction of Taft-Borongan Road, at Kilometer 892+930, Barangay Polangi, Taft, Eastern Samar. The maintenance crew of DPWH has installed warning signs. In order to go to Catbalogan City in Samar, commuters from Borongan, Eastern Samar have to go to Guiuan town and to Tacloban City via Marabut Samar Road, to take a van going to Catbalogan City. In Northern Samar, the Mainland Road Network, Catarman-Rawis-San Roque Section, at Kilometer 769+300, was damaged. A detour road was constructed to restore the normal flow of traffic. The DPWH said that this road is passable only to vehicles weighing 3 to 5 tons. As of January 20, 2011, Pangpang-Palapag-Mapanas-Lapinig Road, Malobago-Panhagdanan Section, at Kilometer 812+350, Sitio Malobago, Nipa, Palapag town in Northern Samar, is hardly passable to all types of vehicles. Meanwhile, the Palapag-Mapanas-Gamay-Lapinig Road, Kilometer 320+000 – Kilometer 821+000, at Ginpandayan area, along Cabatuan-Magtalom Section, as of January 20, is passable only to motorcycles. To date, the damages to infrastructure facilities in Eastern Samar has been estimated at P68,789,500. On the other hand, the damages to infrastructure facilities in Northern Samar has been estimated to be P143,500,000. For the entire Eastern Visayas Region, the total damage to infrastructure facilities has been estimated at P236,700,000. TACLOBAN CITY – In line with the Aquino Administration’s thrust for a more transparent governance, the civil society groups in Eastern Visayas actively participated in the 2012 Regional Budget Forum held on January 13-14, 2011, spearheaded by the Department of Budget and Management Region 8. DBM Region 8 Director Imelda Laceras noted with great satisfaction, the participation of the civil society organizations that expressed their interest and support to the programs and projects of the present government. Among the issues that cropped up during the forum was the issue as to the number and name of civil society organizations to be consulted for the ongoing programs and projects of six piloted Departments namely, the Department of Agriculture, Department of Agrarian Reform, Department of Public Works and Highways, Department of Social Welfare and Development, Department of Education, and Department of Health. Director Laceras moved to park the issue pending the receipt of the detailed guidelines in the conduct of civil society consultations. She gave the assurance that updates on the same shall be disseminated the soonest time possible. Director Imelda Laceras informed that this is the first time that the agency will tap the participation of civil society organizations (CSOs) and other stakeholders in the budget preparation process for key government agencies. “This is the first time that the participatory budget approach is being implemented,” Director Laceras said adding that this is being done to promote wider ownership for and monitoring of the government’s key public services. The forum tackled the recently issued National Budget Memorandum No. 107 dated December 30, 2010 which is the National Budget Call for 2012. The budget preparation for next year aims to strengthen the linkage between development planning and budgeting and increase the likelihood of accomplishing development goals by considering resource availability in the formulation of the Medium Term Philippine Development Plan (MTPDP) and the Medium Term Public Investment Program (MTPIP) for 2011-2016. The memorandum stated that the 2012 budget will focus on fighting corruption and promoting transparency, accountability and good governance; poverty reduction; ensuring sustained and inclusive economic growth; building a motivated, professional, energized bureaucracy; and encouraging integrated and safe communities and the sustainable use of resources for future generations. TACLOBAN CITY – The National Government through the Department of Agriculture has allotted P15 Million for the rice farmers in Eastern Visayas so that they can recover from the devastating effect of flooding brought about by torrential rains. DA Regional Executive Director Leo Cañeda informed the Philippine Information Agency that DA will start the implementation of the Rehabilitation Scheme next week. He said that the provincial agriculturists were called to a meeting at the DA Regional Office last week in order to orient them with the program and to finalize the guidelines in the implementation of the Rehabilitation Scheme for the affected rice farmers in the region. In the proposed rehabilitation plan, DA 8 placed the budgetary requirement for the province of Leyte at P1,708,200; Southern Leyte at P1,431,720; Samar at P82,080; Eastern Samar at P4,600,800; and Northern Samar at P6,163,200. The Rehabilitation scheme which was approved by Secretary Proceso Alcala will entail the immediate distribution of certified seeds or good seeds to affected farmers on full subsidy at 40 kilograms per hectare. RED Cañeda said that the level of devastation calls for quick implementation of the rehabilitation program to sustain productivity gains and to restore the morale of the affected farmers. The master listing of beneficiaries will be based on the official calamity or damage reports validated and submitted by the municipal or provincial agriculture office. The full provision of rice certified seeds or good seeds shall be shouldered by the national government through the Department of Agriculture. The seeds must be procured from any accredited seed grower or seed cooperative. For ease of implementation, the distribution of seeds shall be coordinated with the Local Government Units. In coordination with the seed growers or seed suppliers, the seeds may be delivered at designated drop-off points to fast-track distribution. NAVAL, Biliran – The continuous rains experienced by the entire country these past weeks, did not spare the province of Biliran from damage to road infrastructures. In an interview with Engr. Virginia Sarabusing, District Engineer of the the Biliran District Engineering Office (BDEO), she informed that although the rains experienced by the entire province was moderate and yet they have caused damage to some road infrastructures in the province. She mentioned in particular, the road slip in Barangay Pulang Yuta in the municipality of Caibiran, along the cross country road from Naval to Caibiran. She said, because of the situation one lane of the road in said barangay is being utilized as of now and only light vehicles and motorcycles are allowed to pass through. “Repairs to this road infrastructure have already been started”, she said. Engr. Sarabusing declared that the estimated damage to infrastructures in Biliran resulting from the continuous rains was estimated at P12 million to include minor damages. Meanwhile, Mr. Jaime Casas, Provincial Agriculturist of the Biliran Provincial Agricultural Services Office (OPAS) informed PIA-Biliran that after the survey of the damage to agriculture in the municipality of Caibiran, the Municipal Agriculturist in said area reported that some 26 hectares of ricefields with newly transplanted seedlings were washed out by the continuous rains experienced by the province these past weeks since January 1 this year. He added that a total of 13 hectares of ricefields in the municipality of Kawayan were damaged due to flooding. 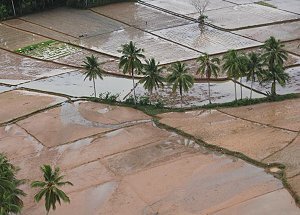 Likewise, in the municipality of Biliran some 15 hectares of ricefields still in their seeding stage were damaged. As of now, the municipal agriculturists in these three municipalities in Biliran whose ricefields were damaged are still continuing to determine the amount of damage. Mr. Casas said, damages to vegetables, fruit trees and other agricultural crops in other municipalities of the province were very negligible. TACLOBAN CITY – Seven new birthing centers have just been opened in the province of Leyte over the week, thereby increasing again the number of birthing centers to more than 20 birthing centers. This makes Leyte one of the province in the country with the most number of operational birthing centers, if not, the highest according to PhilHealth in the region. The latest birthing centers opened which is led by the private entity – the Kakak Foundation – are found in Brgy. Balagtas in Matag-ob, Brgy. Hibulangan in Villaba, Brgy. Inangatan in Tabango, Brgy. Talisayan in Albuera, Brgy. Linao in Inopacan, Brgy. Palale I in Mac Arthur and Brgy. Union in Mayorga, all of Leyte province. Governor Carlos Jericho Petilla, who led the inauguration of these latest batch of birthing centers, envisions Leyte to have the most number of birthing facilities in the country in line with the Millennium Development Goal to decrease child mortality rate and improving maternal health. The establishment of the birthing centers is in support to the local government’s plan to provide various areas in the province with safe affordable birthing centers and thereby reduce maternal and infant mortality. The governor meanwhile clarified reports the birthing centers opened are not accredited by PhilHealth and the health department. “It is just sad to know that despite efforts to address problem on maternal and child deaths in our province, there are still groups who places wrong information on these projects together with the private sector,” Gov. Petilla said. He otherwise urged residents in the barangays where the birthing centers were newly inaugurated to take no notice of the misinformation being circulated against the project. Sis. Eloisa David, an official of Kakak Foundation, on the other hand, maintained that the birthing centers are equipped with all the necessary equipments as well as manned by professional and licensed midwives. The governor likewise clarified that the establishment of birthing centers is privately led and the province’s role is just to provide health insurance to indigent pregnant women through the PhilHealth LGU sponsored health insurance coverage. Apart from partnering with private groups, Gov. Petilla and the provincial government is also among those chosen province for the Japan International Cooperation Agency (JICA) project that would strengthen maternal and child health services, together with the DOH. To recall, the said JICA would provide the services of its Japanese experts such as long-term experts, maternal and child health advisor and project and training coordinators as well as provide such machinery, equipment and other materials and conduct technical training for midwives and barangay health workers who would be manning the birthing centers that would be set up by the province.